At the end of 2016, the number of craft breweries in the USA stood at over 5,000 (Steigerwald 2017). This is an impressive number given that in 2010, there were only 1,754 such establishments (Fig. 1). In 2016, sales of craft beer reached $23.5 billion (USD), which represented 21.8% of total beer sales that year (Brewers Association 2016a). And the craft beer sector looks like it is poised for even more growth. At of the end of 2016, there were over 2,000 additional craft breweries that were in the planning stages (National Beer Wholesalers Association 2017). This growth is occurring at a time when the US per capita beer consumption is decreasing (National Beer Wholesalers Association 2015). Increased consumption of craft beer is driven by increasing numbers of American beer drinkers, particularly millennials, demanding beer that is more flavorful, of higher quality, and more diverse than the beer made by large-scale producers such as Anheuser-Busch (McLaughlin et al. 2016). The growth of craft breweries has not gone unnoticed by city planners, economic development agents, and others whose portfolio of tasks includes revitalizing distressed neighborhoods (Alexander 2013; City of Louisville 2014). Many craft breweries are located in such neighborhoods, attracted there by affordable space. These neighborhoods often have older abandoned buildings that craft breweries can occupy at a lower cost than in many other parts of the city (CBRE 2016b; Colliers International 2015). Craft breweries rarely locate in new, custom-designed, buildings. Rather they prefer buildings that were once used for some other purpose whether it was a church, firehouse, hardware store, jail, or an auto dealership (Galanty 2016a; Powers 2016). The practice of modifying old buildings so that their life can be extended and they can still exist as functional space is termed adaptive reuse (Plevoets and Van Cleempoel 2011). The purpose of this chapter is to examine how craft breweries have embraced adaptive reuse as an architectural “language” to provide the general public with unique and unusual venues within which they can enjoy the consumption of craft beer. We argue that craft beer consumers welcome, and indeed prefer, to drink their beer in spaces that are both interesting and provide links to the past when provided the opportunity to do so. To understand the relationships among adaptive reuse, language, and craft beer, we must first define adaptive reuse and explore its influences on the material and nonmaterial culture of craft breweries. 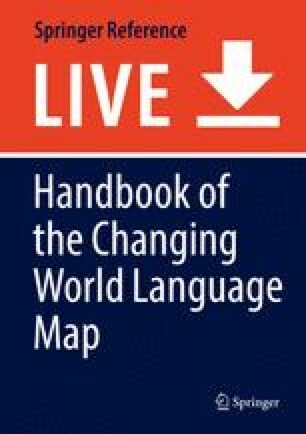 These impacts include both the material architectural elements that have been studied by other scholars, but also the more ephemeral nonmaterial landscape created by the use of evocative language, a subject that has been the topic of much less scrutiny. We contend that both the material architectural elements and the nonmaterial language elements (e.g., naming conventions, nomenclature) can and should be used to create a sense of place that links the craft brewery to the historic past use of the building it now occupies. After we define adaptive reuse, we will then provide case studies to focus on craft breweries that have located in three different types of historic structures – a former church, firehouse, and place of incarceration. All of the case studies illustrate how adaptive reuse, craft beer, and language interact in real-world settings. Adaptive reuse “is a process that changes a disused or ineffective item into a new item that can be used for a different purpose” (Commonwealth of Australia 2004). Buildings typically fall into disuse as a result of the interplay of economic, social, and technological changes (Kalman 2004). When abandonment occurs, it typically does so without any thought as to what is going to happen to the building (Niederhagemann 2011). For a newly abandoned building, there are three options – demolition, vacancy, or new tenancy. Occupation by another tenant often results in adaptive reuse. Typically, the new tenant uses the space for something different than that of the previous tenant. When this occurs, the new tenant does not simply occupy the space as they find it. Rather, they modify the building to make it conform to its new purpose. There are numerous benefits to adaptive reuse. As a practice, adaptive reuse is often cheaper than demolishing and rebuilding. Reuse can contribute to the revitalization of neighborhoods, reduce land consumption, help control urban sprawl, and preserve buildings that have cultural heritage value (Bullen 2007; Shipley et al. 2006; Simons et al. 2017). Heritage buildings, that have historical or cultural significance, are particularly important targets for adaptive reuse as they “provide a valuable glimpse of the past and lend character to communities and therefore should be conserved for future generations” (Bullen and Love 2011: 411). People feel a stronger sense of connection with their local surroundings through heritage, which is quite different to the mentality associated with new building stock, in that it can be replicated anywhere and therefore lends no specific connection to the local environment. Heritage buildings are cultural icons and their preservation impacts on community well-being, sense of place and therefore social sustainability. While it can help to preserve the past, it must be recognized that adaptive reuse requires adding “a contemporary layer that provides value for the future” (Commonwealth of Australia 2004: 3). To be adaptively reused, a building does not have to have heritage value. Indeed, there is a growing recognition that there is significant value in adaptively reusing buildings that are of more “vernacular origins” (Bullen and Love 2011: 412), such as old office buildings, auto repair shops, or retail stores. But if a building has heritage value, adaptively reusing it helps to “emphasize continuity” (Stone 2005: 126) and represents “an opportunity to recycle a beloved structure, to capture and retain all that is best about people’s memories” (Simons et al. 2017: vii). Old buildings, particularly those with heritage value, can be considered a type of renewable resource (Shipley et al. 2006). If they are demolished, they are effectively gone forever. Demolishing an old heritage building is not like demolishing a standardized retail space such as an out-of-date McDonald’s restaurant; the latter can be easily replicated while the former cannot. And residents of cities such as Greenville, North Carolina, bemoan the fact that once demolished, old buildings are gone forever. According to Brad Sauls, who works for North Carolina’s State Historic Preservation Office, “historic buildings help define a sense of place and provide the authenticity” that both locals and tourists find attractive (Kiss 2015). The original use and physical characteristics of a heritage building provide a “vocabulary” with which the building speaks – each with its own unique text, identity, and story. Through adaptive reuse we contend that the original text is edited to provide an updated version of the narrative while retaining some of the original vocabulary. In the world of craft brewing, adaptive reuse is a particularly popular practice. There are a number of reasons why this is so. As noted above, craft breweries frequently seek out inexpensive space for their brewery operations (Colliers International 2015), and it is most readily available in abandoned buildings, often located in distressed neighborhoods. Typically, brewpubs and microbreweries are smaller than the average commercial building. A brewpub is defined by the Brewers Association (2017) as a brewery that produces less than 15,000 barrels of beer per year; at least 25% of this beer is sold on site in the brewpub’s restaurant and/or bar. The beer is often dispensed directly from the brewery’s storage tanks. A barrel of beer equals 31 US gallons. In the USA, the average size of a commercial building built between 1960 and 1999 was 16,300 square feet, while the average square footage for those built before 1960 is 12,000 square feet (U.S. Energy Information Administration 2015). In Ohio and Indiana, for example, the average size of a brewpub is ~7,500 square feet, while the average size of a microbrewery is ~9,200 square feet (CBRE 2016a, b). While craft beer drinkers come from across the demographic spectrum, the market is dominated by members of the millennial cohort (Brewers Association 2016b; Mintel 2013). People drink craft beer for a number of reasons, including quality, variety, and its connection with local communities (Bernot 2015). In terms of variety, craft beer drinkers have an astonishing array of beer styles from which to choose. The Brewers Association (2016c) recognizes over 150 different styles of beer. Craft brewers are also highly experimental in terms of ingredients. To beer’s four basic ingredients (water, hops, malted barley, and yeast), craft brewers often add additional ingredients to create new flavor profiles (Alfonse 2013; Evans 2017; Galanty 2016b). Craft beer drinkers seek out diversity, not just in the beers that they drink but also in the places where they choose to drink the beer. In choosing a craft beer, the freshness of the product has been identified by consumers as being an important criterion (Watson 2016). And, beer is freshest at the point of production, i.e., at the brewery taproom. This partly explains the attraction of craft breweries to craft beer consumers. In a recent study, Carpenter et al. (2013) suggested that the vast majority of craft beer drinkers are what they call “explorers” or “enthusiasts.” A common trait shared by both explorers and enthusiasts is their desire to try as many different styles of beers in as many different breweries as possible. The craft beer drinker’s apparent unquenchable thirst for variety seems to extend beyond the beer per se to include the breweries as well. Creating a unique and interesting space for the craft beer drinker enhances the drinking experience, with some of the most interesting spaces being adaptively reused buildings. There is no inventory of how many breweries engage in adaptive reuse, although a cursory review of brewery websites and media stories suggests that it is a very common practice. Some examples are provided in Table 1. Not all breweries pay homage to their brewery building’s previous use when choosing a name for the brewery. So, for example, Florida Keys Brewing Company in Flossmoor, Florida, is located in an old train station, while Maumee Bay Brewing Company in Toledo, Ohio, occupies part of an old hotel. We provide three examples of craft breweries that do pay homage to their building’s former use both in the name of the brewery and in the names they have assigned to many of their brewed products. 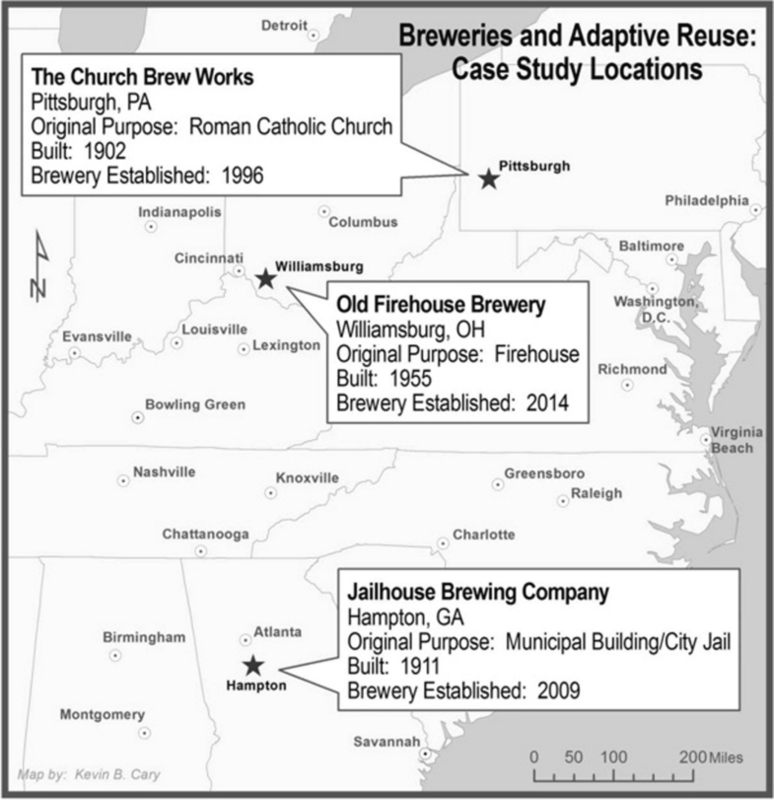 The case study breweries include The Church Brew Works in Pittsburgh, Pennsylvania, Old Firehouse Brewery in Williamsburg, Ohio, and Jailhouse Brewing Company in Hampton, Georgia (Fig. 2). Huske Hardware House Brewing Co. The Church Brew Works is a brewpub located in the Lawrenceville neighborhood of Pittsburgh, Pennsylvania. The brewery, which opened its doors in 1996, is located inside what was once St. John the Baptist Catholic Church. The original church (located at the corner of Penn Avenue and 36th Street) was completed in 1878. The cornerstone of the church that currently houses the brewery was laid at the corner of Liberty Avenue and 36th Street on June 1, 1902. St. John the Baptist Catholic Church was established to serve the thousands of Irish and Scottish Catholic immigrants who moved into the neighborhood to work in Lawrenceville’s burgeoning steel plants. By the late 1950s, however, Lawrenceville, like much of Pittsburgh, started to feel the winds of economic change as steel mills started to close, jobs disappeared, and residents abandoned the neighborhood to seek economic opportunity elsewhere. In 1993, St. John the Baptist Catholic Church was put under an act of suppression by the Bishop of Pittsburgh and closed its doors (Church Brew Works 2017; Western Pennsylvania Brownfields Center 2008). It lay empty for 3 years until purchased by the current owner for $191,200 in 1996, with the desire to turn it into a brewery. The Church Brew Works opened that same year. The new owner was painstaking in his efforts to retain as much of the interior in situ as possible, while making the modifications necessary for the new space to operate as a functioning brewpub. The old pews were hand-cut to create mini-pews, which today are used to seat customers. The brewpub’s bar was constructed by reusing oak planks salvaged from the shortening of the pews. During the renovation process, workers discovered the original wooden floors under the plywood flooring that had been installed 50 years earlier. The original floors were Douglas fir and were carefully restored to their original glory. The church also contained eight lanterns, which were restored. One of the church’s two confessionals was removed and the salvaged bricks reused elsewhere in the brewpub. The second confessional was kept and now houses brewpub merchandise that is for sale. When you enter The Church Brew Works, you have no doubt that you are in what was once a church (Fig. 3). Some of the names used for the beers brewed on-site include Pipe Organ Pale Ale, Pious Monk Dunkel, and Celestial Gold (Hoeller 2014). Thanks to the restoration work undertaken by the owner, the building was placed on the Pittsburgh History and Landmarks Foundation’s List of Historic Landmarks in 2001 (“Pittsburgh…” 2009). The Church Brew Works is not the only former church that now functions as a brewery. Others include Urban Artifact and Taft Ale House, both in Cincinnati, Ohio, Salt Springs Brewery in Saline, Michigan, McMenamins Old Church Brewery in Wilsonville, Oregon, Beer Church Brewing in New Buffalo, Michigan, and Father John’s Microbrewery in Bryan, Ohio (Galanty 2016a; Noel 2017). The process of adaptively reusing a church for a nonreligious purpose is termed “secular adaptation” (Ledbur and Choi 2017: 16). It is interesting, however, that the nomenclature attached to their beers on offer make use of religious themes to a lesser extent than the other two adaptive reuses we examine next. The Beer Church Brewing Company does indeed offer a Crooked Cross Cream Ale and a Pontius Pilate IPA, but the others we found are somewhat reticent to use such religious nomenclature. The first question posed by a reporter for the Chicago Tribune to the owner of The Beer Church Brewing Company was: “Isn’t this sacrilegious?” And while all the former churches and religious properties have been desanctified, the owners of these former religious buildings may be a bit squeamish about pushing the envelope on language, satisfied instead with creating attractive architectural interior spaces that hew closely to the buildings’ original purpose. Old Firehouse Brewery opened its doors in September 2014. It is located in an old firehouse in the village of Williamsburg, Ohio (population 2,536). The three-bay firehouse, built in 1955, was funded by a $20,000 bond issue (Cincinnati Enquirer 1954). One of the current owners spent 16 years as firefighter. In establishing the brewery, the owner wanted to “maintain its firehouse feel and retain a firefighting theme” and give the brewery a “museum-like” feel (Brownfield 2014a). One of the former fire station’s three bays houses the brewing equipment while the other two function as a taproom area with space for approximately 200 people (Steigerwald 2014, 2016). One of the owners meticulously restored the original hooks upon which the firefighters hung their gear (Fig. 4); she also researched the names of the firefighters who worked at the station when it closed and assigned a label with their names to different hooks (Brownfield 2014b). Some of the memorabilia on display was salvaged from the old firehouse while some was donated by local residents, including other firefighters (Cincinnati Enquirer 2014). The donation of memorabilia by residents helped establish a connection between the brewery and the local population, and gave community members a sense that they were contributing to this new business start-up. The owner added to this sense of place by decorating the brewery with historic firefighter memorabilia but also by the nomenclature used for many of its beers. Brews available include Probie Porter (a “probie” is a new firefighter on employment probation during which time his or her skills are evaluated), Flash Point IPA, Nutty Pyro (a nut brown ale that reinforces a stereotype that pyromaniacs are mentally unstable), Burning Bush, Bock Drop and Roll, Engine 103, and Old Flame. The owners see the brewery as an integral part of the community. Williamsburg is a tight-knit town that holds a number of community-focused events during the year. As is common with other craft breweries around the country, the Old Firehouse Brewery supports its local community through a variety of initiatives. For example, in celebration of its second anniversary, the brewery hosted a street party, an event that raised money for donation to the Williamsburg Police Department (Cincinnati Enquirer 2016). The brewery has also donated a portion of the sales of its Pin Up Girl Blonde Ale to Patriot Pin Up Cincinnati, an organization of women who provide support for veterans of the US armed forces (Armon 2014). In a spirit of reciprocity, the community supports the brewery by featuring its beers at community events such as a Lenten fish fry (Campbell and Rasputin 2017). In 2015, one of the owners was the catalyst behind the creation of a new community redevelopment group called Businesses Uniting to Rebuild and Grow (BURG). The group’s mission is to be a vehicle for strategic and purposeful growth in Williamsburg (Alley 2016). Another former firehouse that has been adaptively reused as a brewery is Firehouse Brewing Company in Rapid City, South Dakota (Archibald 2017; Firehouse Brewing Company 2017a). This brewery has two claims to fame. First, it is listed on the National Historic Register (the fire hall was constructed in 1915), and secondly, it was South Dakota’s first brewpub (1991). The three-story building still incorporates the original fire pole and, like Old Firehouse in Williamsburg, Ohio, incorporates many fire station items of memorabilia to enhance the consumption experience. And, in keeping with the overwhelmingly positive attitude of consumers toward fire fighters, the nomenclature used for many of the Rapid City brews is also fire-themed, reflecting especially the unique geographic conditions of rugged topography, unremitting winds, and the drought-related concerns in the Black Hills: Bell Tower Lager, Smokin’ Betty, Firehouse Red, and Smoke Jumper Stout. Two other breweries located in former fire halls are also named Firehouse Brewing Company – one in Indiana, Pennsylvania (Firehouse Brewing Company 2017b), and another in San Diego, California (Firehouse Brewing Company 2017c). The latter was closed at the time of this writing. Naming a beer or even a brewery by the same name in two or more different locations is usually only a matter of trademark infringement if the similarly named products or businesses might cause confusion in the consumer’s mind (Bell 1992: 89–90). As the market penetration of most brewpubs and microbreweries is spatially limited, trademark infringement is usually not a major issue, though it is always wise to register business and product names with the appropriate sanctioning agencies. The Firehouse Brewing Company in Indiana, Pennsylvania, includes the following beers with fire-themed names: Hook and Ladder, Bucket Brigade, and Midnight Alarm (Firehouse Brewing Company 2017b). The Jailhouse Brewing Company (Fig. 5) has been brewing beer since 2008 in the small town of Hampton, Georgia, located within the exurbs southeast of Atlanta. The brewery is located there primarily because it is the boyhood home of its owner and head brewmaster. The owner worked in Hampton at a family business after graduating from Belmont University in Nashville. He was an avid home brewer before he seized upon two opportunities to turn his avocation into a vocation. The first was that an historic, albeit dilapidated, two-story municipal building near his family’s business in Hampton was put up for sale. The structure was commissioned in 1911 and served as a municipal building not only as a jail but also as a fire station, a court house, a Masonic lodge, and a sandwich shop (Totten 2015). To be adaptively reused as a brewery, the structure had to be gutted and the second story removed and rebuilt before the structure was once again safe for occupancy. In the process, the walls were stripped to the original brick and sealed, thus exposing the building’s “rustic beauty” (Jailhouse Brewing Company 2017). In the meantime, the owner completed an American Brewers’ Guild 5-week internship program at Yazoo Brewing in Nashville. The tie-in to community is a common theme of craft breweries, reflecting both their neolocalism and a sharing economy. In the case of Jailhouse Brewing Company, two of the biggest community events are Mexican-themed, complete with a limited release beer called Federale! (a Mexican cerveza) offered at community celebrations such as Clinko de Mayo (jail-themed lingo is used extensively in the naming of events and the beers themselves) and the Day of the Dead chili cook-off in November. The plays on words relating to law enforcement, incarceration, and criminal justice of the brews at Jailhouse are almost endless. Touring the brewery allows the visitor to take home a souvenir pint glass with the company’s logo – a guard tower surrounded by barbed wire that is more reminiscent of a maximum security prison than a small town southern jail. But, the owner and his staff have also added to the lexicon of jail-themed beer names with both their mainstay drafts brewed year-round (Alibi made with Georgia grits as an ingredient, Misdemeanor Ale, Mugshot IPA, and Slammer Wheat) as well as their seasonal offerings (Deep, deep, deep, deep Under Cover; Restraining Order Porter; Conjugal Visit; Saison Reprieve; Breakout Stout; The Judge; Prison Camp Pils; Partners in Crime; Ditch Digger; Community Service; and Smokey) and their more experimental Solitary Confinement series: beers that are produced in small batches and may only be available once (Last Request, Thieves in the Law, Incarceration, Dead Man Walking, Hard Time, and Midnight Special). 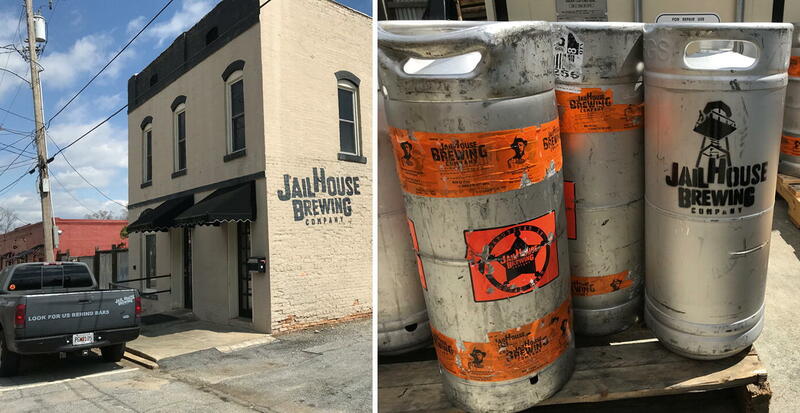 The success of Jailhouse Brewing Company shows that a microbrewery does not have to serve food, can be open limited hours, and focus on the modest goal of increasing its presence in the greater Atlanta area. The convivial atmosphere that the adaptively reused jail has been able to exude has been so successful that, in fact, the brewery may soon relocate to the nearby larger city of McDonough which “may be more willing to accommodate our needs” (Jailhouse Brewing Company 2017). If that move is accomplished, it won’t matter if an older McDonough jail building is adaptively reused or even if a purpose-built building is constructed, because the trade name of the brewery has been well-established. What would then become of the vacant and adaptively reused municipal building in Hampton is anyone’s guess; its market availability may set off another round of investment in the restless consumptive landscape of the greater Atlanta metropolitan area. There are several other breweries located in former jails or prisons, and some are scheduled to open in the near future (e.g., one is to be housed in the former Cambria County prison in Ebenburg in central Pennsylvania). The use of jail-themed nomenclature is a common touchstone in all of them, offering their customers a sense of history of the building’s former use. For instance, the brews on tap at Prison Brews microbrewery in Jefferson City, Missouri include Jailhouse Java Coffee Stout, SMaSH & Grab Galaxy IPA (SM and SH are capitalized because the former stands for “Single Malt” and the latter “Single Hop”), Go To Jail Ale, I Ain’t Your Honey Wheat, Prison Town Brown, Big House IPA, and Misdemeanor Maibock (www.prisonbrews.com/on-tap.php). Prison City Pub and Brewery in Auburn, New York, won the Paste award for best American Pale Ale among 247 competitors with its Mass Riot IPA. Prison City Pub and Brewery also brews Lockdown Brown, Riot in Columbia, and Riot in 1929 based on an actual prison riot that occurred there in 1929 (Prison City Pub and Brewery 2017). But not all former centers of detention necessarily use jail-based nomenclature. Pacific Brewing and Malting Company in Tacoma, Washington, was a brewery that was active in the area until 1916 and closed with Prohibition (Pacific Brewing and Malting Company 2017). Now relocated in the Old City Hall and its Annex, buildings that formerly contained the downtown city jail cell, it has only recently returned to brewing beer, but the nomenclature they use for their beers pay tribute to the history of the Pacific Northwest and not to the use of their location as a former city jail. Prison Break Brewing in Snohomish, Washington, has a Facebook presence but not a company website. It is, therefore, difficult to determine whether or not jail-based nomenclature is used in their operation. And, Jailbreak Brewing Company in Laurel, Maryland, relies more on visual representation than nomenclature to signify its former use as a jail. The graphic of the “J” in Jailbreak on their company logo and glassware is in the form of a key that would unlock a jail cell. The only beer name that might connote its sense of place as a former jail is their double IPA called “Big Punisher” (www.jailbreakbrewing.com). We argue here that overlooked or discarded “heritage buildings” make ideal locations for craft breweries because of the growth potential of these breweries as convivial places to gather. These themed breweries provide the experiences that marketers say young consumers especially are seeking and will allow many of these adaptively reused brick-and-mortar breweries to survive and even thrive in this era of on-line retailing (Thompson 2017). Sociologists refer to such gathering spots as “third places.” Third places represent neither the home nor work environment but are important for social interaction and civic engagement (Oldenburg 1989, 2000; Putnam 2000). The search for such third places will continue. Adaptively reused heritage buildings and refurbished older structures from a bygone industrial age are likely to be popular third places if they employ architectural elements and nomenclature that evoke a strong sense of place. There are some who question what is lost when a former industrial facility (e.g., a factory, a warehouse) with an embedded history of labor struggles is converted to a craft brewery. Often the turbulent labor history of the building’s former use is downplayed or sanitized in the process of land use conversion into a postindustrial space of consumption such as its adaptive reuse as a microbrewery or beer garden (Mathews and Picton 2014). Geographers Mathews and Picton (2014) focus on the impacts of what they term “intoxifying gentrification” on two neighborhoods in the city of Toronto, Canada, that have become the loci of a cluster of microbreweries and microdistilleries. Although the locational context of their case studies is Canadian, their concerns are certainly mirrored in the USA. Still, even less-than-completely authentic adaptation is usually preferable to having the vacant buildings remaining in such a sorry state with negative externalities affecting the wider neighborhood in which the vacant building is situated. Adaptive reuse is a major stimulant in the process of neighborhood redevelopment (Simons et al. 2017). No matter the former uses of the buildings – whether as a church, fire station, or jail – the craft breweries that now occupy those same spaces have reimagined the original purposes through the use of antecedent architectural elements, memorabilia, and language to evoke nostalgia of the structures’ origins and local contexts. Few adapted microbrewery spaces try to refurbish entire heritage buildings. But, the breweries occupying these spaces may still contain architectural elements (e.g., oriel windows, brass door knobs, wrought iron finials, ornate tin ceilings) that speak to the zeitgeist of the architectural period when they were first constructed. Such architectural elements form part of the vocabulary of design and might be best appreciated as a palimpsest – used to form the many layers of former occupancy that can be appreciated by the discerning clientele who frequent such adaptively reused establishments.